Here Lucía Damacela talks with the organisers of the City's first European Union Writers Festival, which took place on May 25 and 26, at Lasalle College. 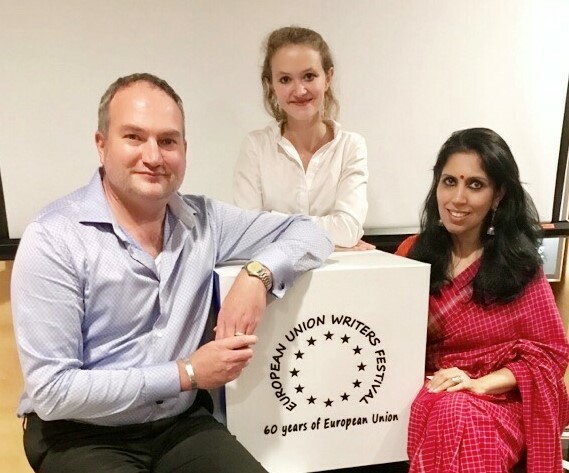 An initiative of Dr. Darryl Whetter, programme leader of Lasalle's MA programme in creative writing, and Deepika Shetty, press and information officer for the European Union delegation to Singapore, the event was sponsored by the European Union, in partnership with Lasalle College. The Festival featured arts professionals from Europe and Singapore, such as writer and theatre director Michael Schindhelm; curator and writer Melanie Pocock; curator and publications manager Anca Rujoiu; writer, researcher and curator Kathleen Ditzig; curator Silke Schmickl; writer, editor and lecturer Benjamin Slater; film director and professor Sebastian Grobler; film and television executive Kenneth Tan; publisher and designer Edmund Wee; poet Joshua Ip; filmmaker, multimedia artist and professor Vladimir Todorovic; and artist and professor Gilles Massot. In his opening address, Dr Michael Pulch, the European Union Ambassador to Singapore, said that culture has become a fundamental pillar of EU external action. This commitment to exploring the variety of synergies available in arts and culture gave birth to the European Writers Festival; a project that adds to the rich and long established cultural dialogue between Europe and Singapore, a key cultural hub in Southeast Asia. In a written statement, Darryl Whetter said: "As my last novel points out, ‘Neither the tomato nor the noodle is indigenous to Italy. Culture moves.’ Here at Singapore’s Lasalle College of the Arts we are, like our Festival partners in the European Union, acutely aware of how culture and art can float past national borders to blossom in new lands. 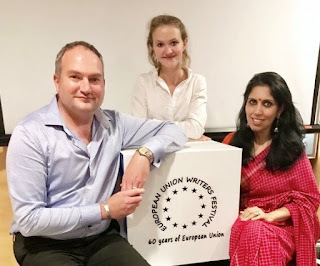 This cultural fusion is even more obvious here in the European Union Writers Festival’s combination of firsts: ours is the first taught creative writing MA in Singapore and Southeast Asia, and we’re delighted to co-host this inaugural version of the European Union Writers Festival." I spoke to Darryl Whetter and Deepika Shetty on the fringes of the Festival. How did the idea of the European Union Writers Festival in Singapore emerge? DS: 2017 marks 60 years since the founding of the EU. We have been looking to add to our programming in this significant year, which also marks 40 years of EU-ASEAN ties. We already have a long established film festival, which is in fact Singapore's longest running foreign film festival. I was looking to add to the existing cultural calendar and words felt like a fitting start to keep the conversation going. DW: To provide a professional reading opportunity for our European students doing the MA in creative writing. DS: The idea was to find writers who are already here, to create something intimate and have a platform that further complements Europe's and Singapore's long-established cultural ties. We wanted to have also an inclusive arts festival. It was something we paid close attention to while programming it. Do you have plans to organise similar festivals in the future? DS: It is my hope & wish that the Festival will continue. I am convinced in Darryl & the Lasalle College of Arts we have the perfect vision, platform & partner to take the Festival forward. I also asked Darryl Whetter a few questions about Lasalle's creative writing programme. What role do events like the Festival play within the programme? Lasalle has a strong commitment to professional exposure and experience for students in all programmes. It’s rare to find a creative writing programme at an arts school. Our programme already has the advantage of writers working alongside actors. As programme leader, I was able to bring in an acting professor to help train our students to read publicly and perform their work. What are the most distinctive features of the programme? We teach writing as an art alongside other arts. Literary language is language at its most fluid and beautiful. Here, our writers study alongside painters, filmmakers, designers, dancers, photographers and actors. English-language creative writing programmes are one of the rare growth areas in the arts and humanities, yet elsewhere writing students and faculty are isolated from other artist-researchers on campus. Study creative writing elsewhere, and you’re more likely to work alongside a Dickens scholar or a historian than an actor or sculptor. Study creative writing at Lasalle, and you’re one of many artists and art professionals. My slogan for the programme is: "unique voices, telling stories." Can you list some visiting authors who have collaborated with the programme? Cheryl Lu-Lien Tan. Dr. Cyril Wong. Dr. Divya Victor. Dr. Julia Sukys. Joshua Ip. Prof. Robin Hemley. Balli Kaur Jaswal. Prof. Philip Holden. Carmine Starnino. Epigram Books Founder, Publisher and CEO Edmund Wee. Our Festival authors, including Heng Siok Tian and Yong Shu Hoong. And that’s just in one year! What do you think of the writing scene in Singapore? The literary scene here is exploding. The Epigram Books Prize recently doubled. Math Paper Press is vibrant. The Singapore Writers Festival gets bigger every year. Our creative writing MA is designed to both reflect and deepen this fecund literary growth. What is your message to potential applicants to the programme? Do it! People who haven’t studied creative writing may have a false impression that writing can’t be taught. This is not true! Almost anything can be taught, writing included. I promise that a dedicated student will be a better writer by the close of a course or programme. Also, Lasalle now offers evening courses for beginners, in our short course programme. These low-cost, non-credit, evening courses can even be covered by a government grant. Click here for details.